The dense network of cables that make up the Internet is likely to be inundated with saltwater as sea levels rise, a new analysis suggests, putting thousands of miles of critical infrastructure along U.S. coastlines underwater in the next 15 years. "It is actually the wires and the hardware that make the Internet run," explains Ramakrishnan Durairajan, a computer scientist at the University of Oregon and an author of the research. The analysis estimates under the most severe model for sea level rise that more than 4,000 miles of fiber optic cable along U.S. coastlines will be underwater by the early 2030s. If thousands of miles of cable were flooded because sea level rise, it could potentially impact Internet reliability for millions of Americans in major cities. In fact, higher temperatures and more powerful storms, both of which are more likely as the climate changes, have already affected Internet hardware. In 2015, a heat wave in Australia fried air conditioners at a key data center, cutting off a major company's Internet service for hours. In 2012, Superstorm Sandy knocked out some Internet in New York City when floodwaters cut off power and drowned the underground cables that carry data. At the time, Verizon's executive director of operations told The Verge that there had been a "catastrophic failure." After Hurricane Irma blew across Florida last year, the Miami Herald reported that many people were without Internet for weeks. Rising sea levels will make the flooding from such storms worse, as NPR has reported. The newly published analysis sets aside storms and, for the sake of clarity, focuses on predictable flooding from sea level rise. Large, dense coastal cities such as New York, Miami and Seattle appear to have the highest risk of Internet disruption from sea level rise. Internet service providers say they are already thinking about the risks from flooding along the U.S. coasts. AT&T uses fiber optic cable "designed for use in coastal areas as well as being submerged in either salt- or fresh-water conditions," spokesman Jeff Kobs says. "In certain locations where cabling will be submerged for long periods of time or consistently exposed, such as beaches or in subways, we use submarine underwater cabling." One way to mitigate flood risk is to replace copper wiring with more flood-resilient cables. 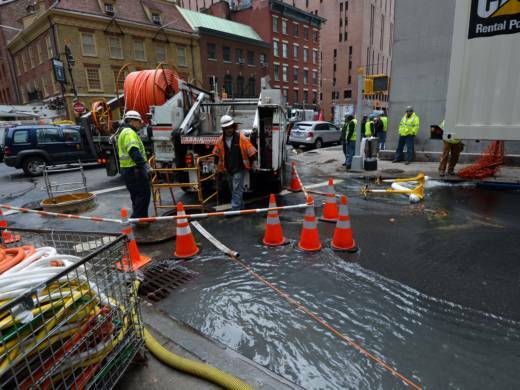 "After Sandy, we started upgrading our network in earnest, and replacing our copper assets with fiber assets," says Verizon spokeswoman Karen Schulz. "Copper is impacted by water, whereas fiber is not. We've switched significant amounts of our network from copper to fiber in the Northeast." She says Verizon has also elevated buildings and power stations in areas that flood. In most cases, the company's focus on flood risk "really has less to do with sea level change, and more to do with general flooding concerns," Schulz explains. The one exception is at so-called cable landing stations where undersea cables connect the U.S. Internet to the rest of the world. "For cable landing stations that are very close to the oceans and that have undersea cables, we specifically assess sea level changes," Schulz says. Some cities are already working on hardening Internet infrastructure to handle the effects of climate change. For example, public buildings in and around Seattle are connected by fiber optic cable meant to make the region more resilient to disasters, including floods. Other cities are rethinking how and where they build roads, which could affect where Internet infrastructure ends up; cables often follow highways and other public rights of way. Durairajan says that upgrading hardware is one good strategy, but that avoiding Internet disruptions from sea level rise also might require companies to rethink the way data flows through their networks. For example, he says, if some wires are temporarily flooded, "can we reroute traffic from that area, to keep communication going? Can we isolate damage at coastal areas from inland assets? We have to start the mitigation strategies and planning right now."